This page is dedicated to the PHRF fleet. Four boats came out in the face of a forecast for a Southerly gale. The wind at City Dock after the start was coming from 175°M at 13 Kts. with gusts to 16. Reportedly, after the boats rounded Marrowstone Point they found 30+ kt. southerly winds and 3 foot seas. Magic Bus retired with a broken main halyard. Knot Raven, equipped with reef points, wisely retired, apparently before breaking anything. Owl did not report a finish.. SCHEDULE – Saturday April 13 th. The Warning signal will be at 10:00 hrs on City Dock. 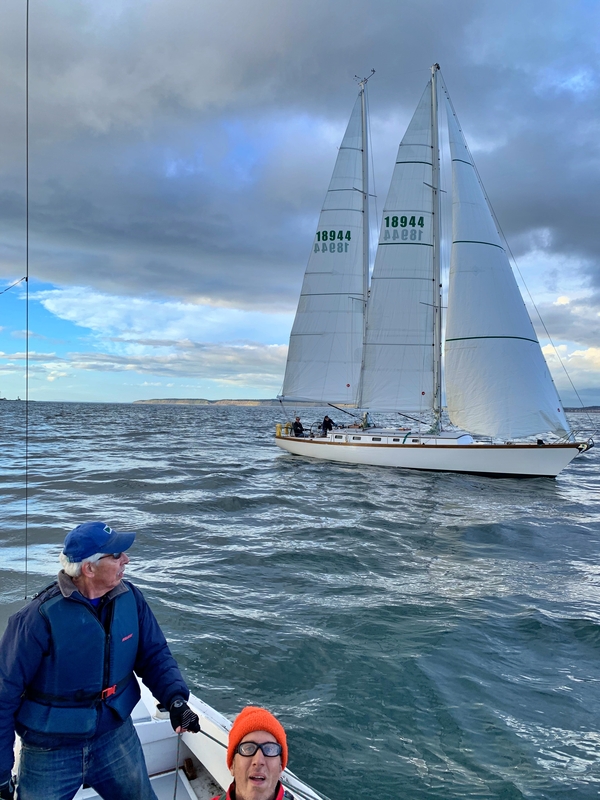 RULES – As in 2019 Sailing Instructions for PTSA Races, except as amended herein. COURSE – Cross Start line at City Dock towards NE. Round mark “SC” to port (it’s the yellow mid-channel buoy West of Bush Point). Cross the Finish line at City Dock towards SW. Course distance is 14.9 nm. CLASSES – All boats will start together and race with a PHRF handicap. IDENTIFICATION – All boats, especially visitors, check in with the RC at the City Dock before the start to make sure their PHRF rating is recorded. SHORTENED COURSE – There is no provision for shortening course. TIME LIMIT – There is no time limit. FINISH TIMES – The finish will be unmanned. Each boat will record their finish time, preferably to the second (use GPS or cell phone time) and note the names of the nearest boats ahead and behind them (if visible). All this information is to be e-mailed within 48 hrs after the finish to racecommittee@ptsail.org. REQUESTS FROM USCG – All vessels must be aware of COLREGS Rule 10 (Traffic Separation Schemes) and must comply with such regardless of their competitive position at the time. – All vessels should monitor VHF Ch 05A. ALERT! McCurdy Pt. race noon April 20, City Dock ALERT! 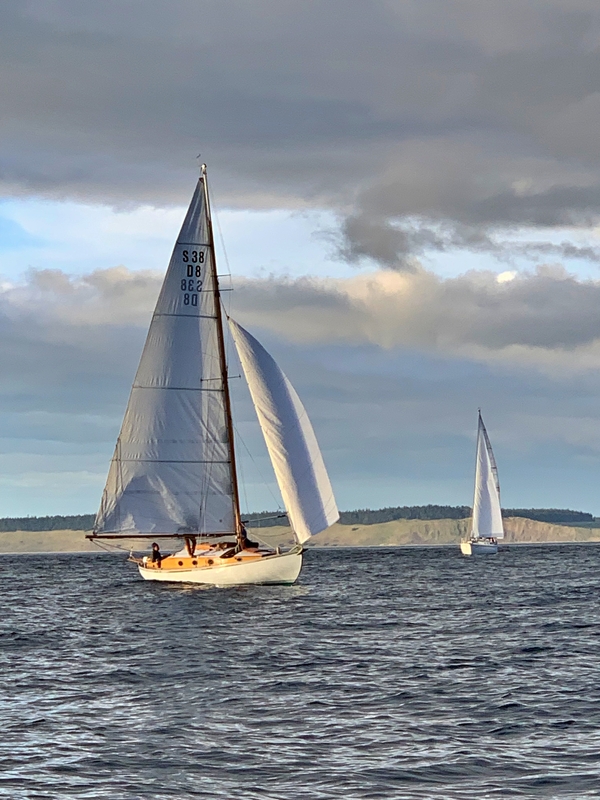 Since a number of the boats in the PHRF fleet could not make the Wednesday evening races we have added a new series that will run on Fridays starting at 6:15pm. The first race is 4/5/2019. All boats are welcome. If you are not sure what PHRF means and want to know more click here. And don’t forget the kickoff party this Thursday! The Tour-de-Bay was the fourth and final race of the Distance series. The course set was SBHGIYTBF, 11.9 nm. The start, from City Dock, was delayed by half an hour for lack of wind. For the early part of the race there was good wind East of a line from Point Hudson to Indian Island Navy Pier but very little to the West. Distance Race #4 – TOUR-de-BAY, This Sunday. The TOUR-de-BAY Distance Race is this Sunday, July 29 th. This race provides a challenging change from short W/L courses. An approximately 15 nm. course, depending on wind, set inside the bay. With multiple legs varying from .5 to 3 nm., using all points of sail, in and out of current. Every sailboat welcome, with or without a PHRF rating. Start from City Dock at noon. Eight boats came out on a warm and sunny weekend for this popular, two race, overnight party. The races are part of the Distance Series. The Saturday race had the potential for congestion with the PTYC Opening Day parade and the massed finish of the STYC Race to the Straits pursuit race. These proved to be non-problems. The wind on City Dock at the start of the Southbound race was ~8 kts. ±2, hovering around 290 ±10 deg.M but it appeared weaker and more Northerly away from shore. With the N wind and flood current the leaders turned in times of around three hours for the 15.4 miles. The Saturday evening BBQ around the fire pit was reported to be a great success. As was the very extensive breakfast on Sunday. The Northbound race on Sunday suffered light winds. At the start ~3 kts. Northerly wind was measured on the beach at Burner Point. Out in the bay it was very patchy and the fleet was observed having a struggle to reach the mouth of the bay where a little more wind could be seen on the water. For the return trip, to windward, the leaders needed about four hours. Further back, some ran out of patience. Distance Race Series – Port to Port – May 5 th. & 6 th. It was a cool, but not rainy, race with better than expected winds. Four boats came out and everyone finished in under three hours. Owl was first across the line with an impressive performance beating the three much bigger boats. Next distance race is Port to Port from PT to Port Ludlow with an overnight stay in Ludlow (May 5-6). Sparkle leads Pacifica out of the bay. Owl leads Pacifica into the Strait. 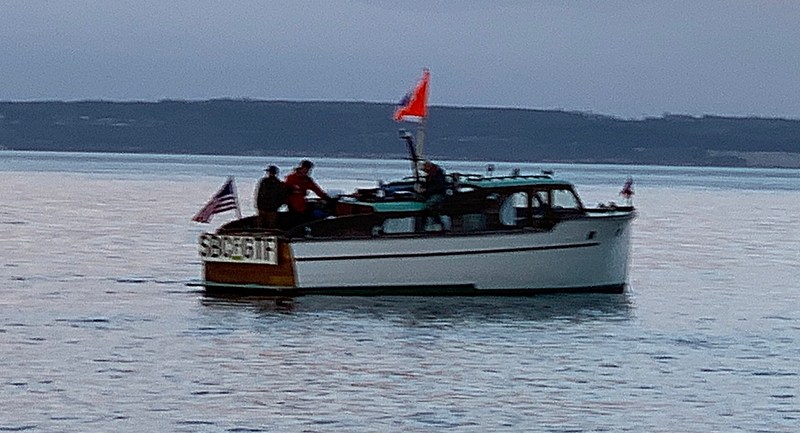 Although not a competitor, Andiamo Again was the only boat to represent the PTSA in Sequim Bay during the SBYC Hospice Regatta.